With ultra-high tensile steel, the Quick Draw capo flexes to conform to the curvature of the neck of the guitar, making string hold down forces as low as possible. Thus, there is no pitch distortion as with earlier capo types when imprecisely positioned or adjusted. 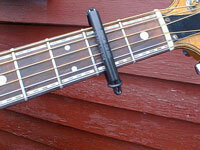 Ultra-low friction plastics make it possible to slide your Quick Draw capo thousands of times without wear.